Home > climate change, science, statistics	> >New Zealand not warming? >It seems to residents that the country has not being getting warmer over the last decade. Such that advocates of global warming prefer the term climate change so that any weather anomaly can be attributed to anthropomorphic global warming. And people are willing to parrot claims that some parts of the world will get colder (this may be a prediction of the theory but should encourage one to cautiously consider these claims). The New Zealand National Institute of Atmosphere and Water Research (NIWA) do not show significant change since 2000 but they do show an increase over the last century as seen in this graph. Graph. Mean annual temperature over New Zealand, from 1853 to 2008 inclusive, based on between 2 (from 1853) and 7 (from 1908) long-term station records. The blue and red bars show annual differences from the 1971 – 2000 average, the solid black line is a smoothed time series, and the dotted line is the linear trend over 1909 to 2008 (0.92°C/100 years). 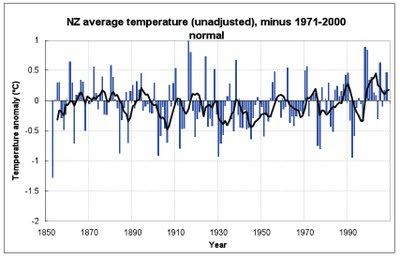 Yesterday the New Zealand Climate Science Coalition released an article challenging this rise using NIWA’s own data. They plotted the temperatures from the NIWA source data and got this graph. Whereas the first shows a rise of ~1°C per century, the second shows no discernable rise. The difference between the 2 graphs? The second uses raw data, the first (probably) has adjusted the data. About half the adjustments actually created a warming trend where none existed; the other half greatly exaggerated existing warming. There are legitimate reasons why data can and should be adjusted. Cities grow and hence warm so later temperatures may be warmer, especially overnight. Different thermometers may be used that show a consistent measurable difference. But there are 2 comments to make about adjusting data. Firstly adjusted data should be labelled as such with the unadjusted data displayed alongside it and the factors the data was adjusted for. Secondly, it makes a difference whether adjusting data removes or produces an association. Frequently differences in data are seen because they attributes of the data sets are different. If we compare test scores between highschools to create a league table it may be reasonable to correct for number of children in different grades as some schools may have more students at higher levels, or one school may only let its brightest children sit the test. But we should be more cautious about accepting an association that only appears after adjustment. It is not that there can be no difference, rather it is that enough statistical manipulation can show a difference and the reasons for the adjusted variables are then argued after the fact. If you do find a difference after adjustment you need to check your adjustment factors are not associated with the variable that is under consideration, in this case you cannot adjust for time as time changes are what is being looked for; and you must validate your adjustment with an independent data set. On top of the release of emails and computer code from the now infamous Climate Research Unit at the University of East Anglia, UK; perhaps there might be some room for debate around the issues of climate change. Is it happening? Are humans responsible? Would it be detrimental? Should we pay attention to scientists who refuse to reveal their data and formulae? Ah, you have been fooled by this too? Have a look at Hot Topic’s post (NZ sceptics lie about temp records, try to smear top scientist Ã¢ÂÂ Hot Topic) which explains this latest deception. Apparently the author of the report has acknowledged his mistake but I guess we won’t see Wishart, etc., withdraw and apologise. NIWA has also commented on these lies. Frankly I think there is scope for legal action seeing that news release (and your repeat of it) is smearing a highly regarded scientist. So – here’s a challenge. If you claim any objectivity on this matter what about apologising for the mistake, withdrawing the post and producing a new one explaining this dishonest deception on the part of our local climate change deniers. Where is my mistake Ken? I showed the 2 graphs, I stated that one was adjusted, and then posted on issues surrounding adjustment. And I stand by my comments. NIWA’s graph does not mention the temperatures are adjusted, this should be stated. Your link states that Treadwell (the authors) lied which is a tenuous claim. You also comment these are lies but disagreement with the truth does not make one a liar. There is nothing in my post that is smearing. The call for legal action is ridiculous. It is imperative in science to challenge claims, to attempt to find holes. When no holes remain the theory is more robust. Honesty would demand a full accounting as to which data was adjusted and why. Preferably releasing the computer code for the adjustment if this is what was done. Then other scientists could validate it. You didn’t check it out, did you. The Hot Topic post is very clear. And NIWA didn’t hide anything. On the contrary, Wishart and his mates did the hiding and now they try to obscufate. The science should be done bt the scientists with the expertise. Honest ethics, and checking procedures. These guys have just resorted to lies, have no honest ethics and didn’t submit their little “report” to any peer review. But they fooled you, didn’t they? Grant – you haven’t read Hot Topic’s post (NZ sceptics lie about temp records, try to smear top scientist Ã¢ÂÂ Hot Topic) either – have you? Ken, Grant’s comment is not about him reading or not reading the link you posted, it is about your accusation that I did not read the link you posted. 1. Did you read my post before you commented? 2. Do you really think I did not read the link you posted? 3. Did you read the Treadwell article? 4. Do you know where to find the adjustments to the NZ data and the explanation of all the adjustments? 5. Do you think that an incorrect claim is equivalent to a lie? Yes, to all. However, you have now followed up Garetj’s article and the NIWA description I recommended and to some extent corrected your position on your subsequent post. However you are still attpting to find fault with NIWA / while at the same time ignoring the deliberate distortion in the original press release. These people knowingly combined data from different stations without correcting for different altitudes. And why did they do that? Because it could then be used to show no trend in temperature! Yes that is dishonest. I think Gareth was justified in calling it a lie. And on top of that they had the dishonest cheek to question the integrity of NIWA scientists! So, congratulations on correcting some of the material in this post. But, shame in you for not questioning the integrity of the deniers while continually trying to attribute bad integrity to NIWA scientists. 1. The reason I asked question 1 is that you did not appear to grasp what I wrote. It was about being upfront with adjustments. I acknowledge in my post the need for adjustment at times. 2. I find it interesting that you think I did not read the link when referenced something from the link and wrote a post partially based on you link. 3. Then will see that they specified their data was not adjusted and that they thought NIWA’s was adjusted and stated they thought the adjustment needed explanation. 4. Could you link to the where the adjusted data are and the formulae that are used to make the same adjustment? 5. Your answer to 5 suggests that when you change your opinion on any topic this proves you have previously been lying. How can they make adjustments, they do not have the appropriate material. That is their request (if I understand them correctly), NIWA to specify all their adjustments and why. They knew what they were doing. It was dishonest. Any unbiased commentator would be placing their attention on their attempt to deceive – not making unwarranted artacks on the scientists doing the work. How much combined data was used to construct the graph? I seriously doubt the adjustment (made or unmade) would have any noticeable effect on the graph if enough different stations were involved in the study. * What stations have been adjusted? * When were they adjusted? * Is the adjustment stepwise or a trend? * Is there overlap of data when stations are shifted? * Does the overlapped data show good correlation? * Have adjustments been modified in subsequent years? Why? * What is the computer code that applies the adjustment? We have raw data that shows no trend and a group adjusting this data (which may be necessary) by an undisclosed method. Not only are these reasonable requests, they should not even be necessary, the 2 extensive data sets (adjusted and unadjusted) should be available with explanation of every difference. You are again diverting away from the real issue which is the false use of data by the deniers to attempt to prove no temp changes. Many of the sort of qustiond you ask have been covered by NIWA and Gareth. If you have further you shoul approa h them, rather than drawing unwarranted conclusions. But what about directing you attention to those sho don’t have scientific expertise in this area, yet manipulate data to reach a preconceived conclusion, lie about the data and NIWAs use of it, and attack the integrity of honest scientists. Just to satisfy their extreme conspiracy theory. Come on, get stuck into the real liers. Ken, I am not diverting, this was the topic of my post. The “deniers” cannot adjust the data, they do not have the information needed (that I am aware of). And they cannot lie as they do not have enough information to distort. They are calling for release of information. And the people who are adjusting the data do have the information, yet they refuse to release it. In essence NIWA are saying we know what the real situation with temperature, but we won’t prove it, you’ll just have to trust our conclusions. If the climate department of Melbourne stated they had raw data from the Southern hemisphere which showed a temp increase of 1 degree over the last century, but after an adjustment (that they refuse to disclose) there is no longer any evidence of temperature change in the last century and thus AGW is now under questionÂif this was the case would you accept their word and abandon the theory of global warming? Or would you want an explanation as to their adjustment and the algorithms checked? Don’t cheer for your team just because they are your team. (1) The deniers did have the information – they presented it! They could have calculated their own correction factors. But of course they wouldn’t do that while they could support the own preconceived argument with the uncorrected data. Your claims about NIWA are of the “When are you going to stop beating your wife sort.” There is an attempt to present NIWA as hiding something. But no evidence to support that claim. NIWA is jusdged guilty before any evidence is collected! We have seen the discussion of the Wellington station – presumably that data was taken from the accessible NIWA database. Data for the other stations could be accessed similarly. Until I am presented with objective evidence that NIWA is hiding something I will accept that they aren’t and that this claim is just another lie put about by the deniers. If you choose to believe their story without evidence you have your own agenda. If you have evidence – PLEASE PRESENT IT! (2) Interesting way you think – about teams. I actually aren’t on any team. I don’t have a commitment either for AGW or against AGW. I do have a commitment to truth – and that’s why I criticise those deniers who have been caught lying. (a) As a scientist if I was reviewing the work, publication-wise or auditing, of course I would expect to see the data or good summaries of it. I would expect to have the methodology adequately explained. My report would point out any deficiencies in that area and of course I would expect those aspects to be attended to. Quite a normal procedure. My approach would not be influenced by the researchers’ conclusions. (b) As an interested citizen I would not require every intricacy of the data to be explained to me. Only the summary. The fact that all the intricacies were not included in public media reports would not be at all surprising. I would certainly not question the integrity of the scientists involve on that basis. In a sense I would trust them until I have information pointing otherwise. Exactly the same situation as with NIWA. (c) While I would be prepared to hear any objective evidence of fraud wrt to these results, if claims of fraud came from those with a denialist agenda and were of the “when are you going to stop beating your wife” character, I would ignore them. Especially if they had already been caught lying about the data. 3: Scientists should not be on a team. they should be collecting evidence and testing it against reality. Of course they must then come to conclusions and make recommendations – which has happened in this case. To accuse them of being “on a team” because of that normal procedure shows your own way of thinking. You are on a team. You have a preconceived commitment to a conclusion. You will cherry pick and distort facts to satisfy your teams agenda. I don’t listen to people like that. You can dabble to your hearts content in the data at the National Climate Database where NIWA has made information available. See if you can find evidence of wife-beating there. Then you shouldn’t talk either. Shut up and go away.